(Duveen Brothers, New York and London); sold 1901 to Peter A. B. Widener, Lynnewood Hall, Elkins Park, Pennsylvania; inheritance from Estate of Peter A. B. Widener by gift through power of appointment of Joseph E. Widener, Elkins Park, Pennsylvania; gift 1942 to NGA. 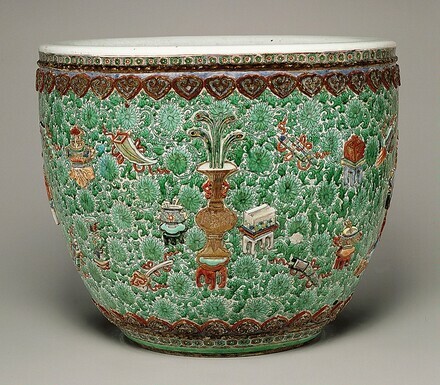 The interior is covered with a greenish white glaze, with minor chips in the glaze around the rim. Below the rim of the bowl is a ring of raised leaf-shaped motifs covered with discolored paint applied during a restoration campaign before the bowl entered the National Gallery collection. The bowl has a significant number of glaze losses, ranging in size from ½ to 2 inches in diameter. The losses are located over the exterior surface but are clustered at the widest part of the vessel, especially among the green rosettes in the background. In general, the glaze is a poor fit for the body, resulting in its extensive shivering. The bowl has undergone conservation treatment to secure the glaze. Bower, Virginia, Josephine Hadley Knapp, Stephen Little, and Robert Wilson Torchia. Decorative Arts, Part II: Far Eastern Ceramics and Paintings; Persian and Indian Rugs and Carpets. The Collections of the National Gallery of Art Systematic Catalogue. Washington, D.C., 1998: 223, color repro.